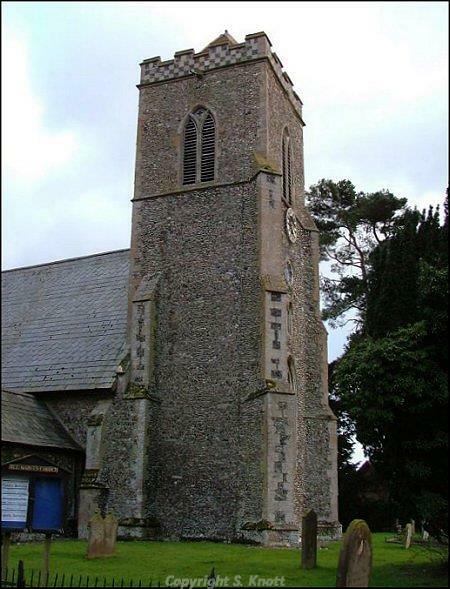 The parish of Shelfanger is situated in the south of Norfolk. It lies northeast of Bressingham, northwest of Diss and south of Winfarthing. The name Shelfanger may derive from the Old English meaning ‘Sloping wood on a shelf or pinnacle’. The parish has a long history and was certainly well established by the time of the Norman Conquest, its population, land ownership and productive resources being extensively detailed in the Domesday Book of 1086. According to the document the parish lands were held by a number of individuals after the Norman Conquest including Godric, Hervey and Edric. There is also mention of woodland and pigs as part of the parish’s assets. The first evidence we have for human activity in the parish dates to the Neolithic period. Several Neolithic polished axeheads and a knife were found by ploughing in 1986 and 1989 (NHER 25649). These objects were felt to be part of a Neolithic hoard. The only other find from prehistory takes the form of a single worked flint (NHER 25340) from Church Walk. Sadly, no sites or finds dating to the Bronze or Iron Age have been discovered in Shelfanger. Of course this does not necessarily mean that there was no human activity in the parish during these periods. Indeed, archaeology relating to these times may merely await discovery. Metal detecting has recovered a couple of Roman coins from the parish. One of these was identified as a coin of Faustina I (NHER 36095) and the other as a coin of Magnentius (NHER 38061). The only other Roman finds were a few pottery sherds (NHER 25340) found on the grounds of the former school. Similarly, there are only a few isolated metal objects to represent Saxon activity in Shelfanger. These finds comprise two Early Saxon brooches, one whole (NHER 25340) and one incomplete (NHER 38061) as well as two Middle Saxon pins (NHER 38061). It is in the medieval period that we begin to get more of a picture about life in Shelfanger. All Saints’ Church (NHER 11001) and a chapel dedicated to St Andrew (NHER 14906) both existed during medieval times. All Saints’ has an early 14th century tower with battlements. The chancel and the north door are contemporary, and it seems likely that the scissor-braced roof of the nave dates to the same period. Inside, there is a 14th century octagonal font and a number of superb mid 13th century wall paintings. According to documentary sources this is also the site of St Anne's holy well during the medieval period. Little evidence survives to attest to St Andrew’s Chapel. It was still standing in 1518 but was removed at the Dissolution. A medieval manor house may have been situated in the Fiddler’s Dykes area of Shelfanger (NHER 10886). An unusual moat exists here and it has been proposed that the north corner of this moat was the sit of a medieval manor belonging to the ‘Vise-de-Lou'. However, the fact that recent building has heavily disturbed this site makes it difficult to investigate these claims. A more likely medieval moat has been identified to the southwest of Church Farm. Aerial photographs of this area show the remains of a moat, ditches and tofts dating to the medieval period (NHER 24984). A number of fine buildings were also erected in the parish towards the end of the medieval period. These include Ventura Cottage (NHER 38115) and Gunn House (NHER 45816) on The Street. Both are timber-framed structures and Ventura Cottage may have been formed from a medieval open hall that had the service bay demolished and an upper floor inserted in the 16th century. Manor Farm (NHER 10986) is another timber-framed hall house dating to the 16th century, but this property is situated within a moated complex which perhaps provides further evidence for a late medieval date. Regarding medieval small finds, the numbers retrieved from Shelfanger are limited. However, two particularly fine items have been found in the parish. The first of these is a silver figure of Christ crucified that would once have been part of a crucifix (NHER 25340). The other is a seal matrix made from lead and belonging to a certain John Drayton (NHER 36095). Another medieval curiosity is the wooden door (NHER 11002) incorporated into a building at Church Farm that may once have been a fitting of the parish church (NHER 11001). The only other finds are rather more mundane, and consist of unglazed pottery sherds (NHER 31183). Most of the archaeological records concerning Shelfanger relate to residential properties built during the post medieval period. Most of these fine buildings are situated along The Street, Church Road or Rectory Road and they take a variety of forms. For example Bridge Cottage (NHER 45684) on Church Road is a traditional rural dwelling dating to the 17th century with a timber-frame construction and a thatched roof. Another property of similar date is the former Crown Inn on The Street (NHER 48720). This former public house has been converted into two dwellings and has a roughcast exterior and timber frame. Another building dating to the early post medieval period is The Old Rectory (NHER 40346) on Rectory Road. This may once have been a 14th/15th century aisled hall, although the current building is of 17th century date. It has also been suggested that this was the manor house of Hoes alias Boseviles. A more obvious manor house is Shelfanger Hall (NHER 10994). It is situated within a moat, and the timber-framed hall is of 16th-17th century date. It is particularly noteworthy for its jettied upper floor and large chimneystack at the east end. Shelfanger also possesses several buildings that date to the later part of the post-medieval era. The Old Baptist Chapel on Common Road (NHER 28261) dates to 1824. It is made from red brick with a pantile roof and renovations undertaken in 1991 discovered the near complete skeleton of a young adult female of unknown age. Shelfanger Lodge on the Diss Road (NHER 48864) also dates to the early 19th century. The Lodge is quite different to many of the properties that have already been mentioned as it has a stuccoed exterior and a low pitched hipped slated roof with lead rolls to the hips and ridge. The only archaeological evidence for trade and industry in post medieval Shelfanger takes the form of a sawpit (NHER 11003). Little is known about this other than its supposed location near to the modern Druids Lane Cottages. Small finds dating to this period include a tinned buckle with foliate decoration (NHER 38061), rumbler bells (NHER 25340), a bronze coin weight (NHER 25340) and random coins and tokens (e.g. NHER 37114). There are no archaeological records for Shelfanger dealing with finds or features dating to World War One, World War Two or the modern period. Thomas Sunley (NLA) 19 May 2007.